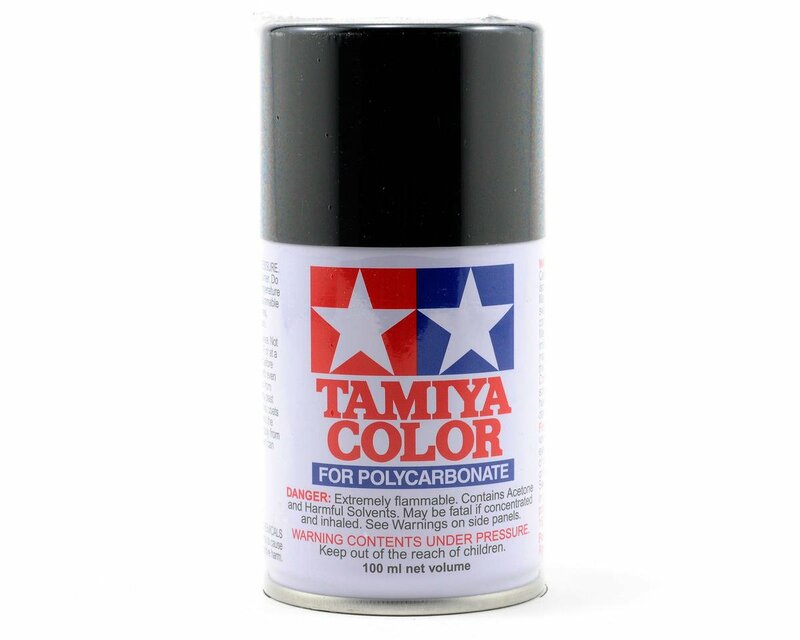 This is a 3oz can of black polycarbonate spray paint from Tamiya. These spray paints were developed especially for decorating transparent polycarbonate (Lexan) bodies used in R/C car modeling. Each can contains 100ml of paint, which is the appropriate amount for finishing a model. Small detail work should be brush painted beforehand using Tamiya bottle paints for polycarbonate. Paint the body from the inside, keeping the can about 30cm from the surface. After curing, apply another coat. These paints are impervious to oil and fuels, so they can be safely used on gas-powered R/C bodies. Never use these paints on plastic models. never had the issue the other person decribed. used this paint on 5 bodies so far emaxx 2 of them hyper10 a Friends slash raptor body and my 5b desert rat body. never had this paint flake or chip. worse if gotten is with tamiyas lighter colors taking a lot of coats to cover well. buy more paint then u think ull need. 2 cans of red / blue for a sc or monster truck top wont cut it. For an 1/8 scale rally body, I needed two cans to fully paint the body with multiple coats, and for a 1/10 scale 2WD buggy, I only needed one. It's great as a main color or as a backer. I start with lighter coats and progress to heavier ones (heavier ones right away if it's the backer), keeping an eye out for wet spots before they form. I wait 15-20 minutes between coats, and a full day before using the body on a vehicle. With this method I've had zero issues with flaking or anything of the sort. This'll be my go-to brand of RC paint.